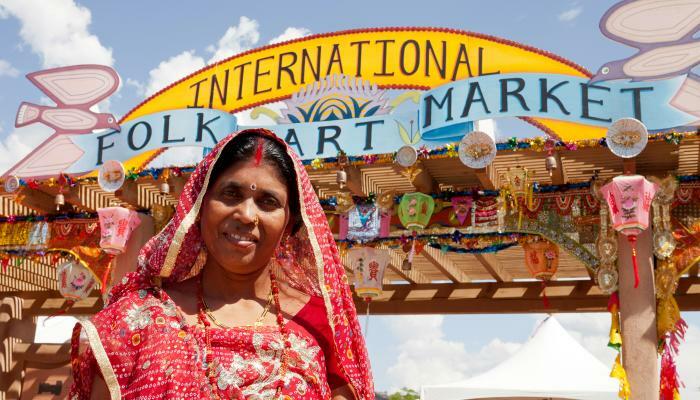 Get your tickets , book your room and get ready as Arlington, Texas, prepares to host the first Sister Market location of the world-renowned International Folk Art Market | Santa Fe, voted the Best Art Festival in America by USA Today. Taking place June 16-17, 2017 at the Green at College Park on The University of Texas at Arlington campus, the Santa Fe International Folk Art Market at Arlington will feature 35 master artists selling their handmade artwork, jewelry, textiles, home goods and more from such diverse countries as Italy, Ghana, Uzbekistan, Nigeria, Ukraine, South Sudan, Myanmar, and Peru, among others. The Santa Fe International Folk Art Market at Arlington will begin on Friday, June 16 with “ A Night in Old Havana, VIP Shopping Event” at the Green at College Park, where guests will enjoy the ambiance of a Night in Old Havana, and have the first opportunity to shop the market. On Saturday, June 17 the Market will be open to the public and include internationally inspired food and entertainment and of course beautiful artwork for sale. The International Folk Art Market | Santa Fe, a program of the International Folk Art Alliance, was created in part to help artists from around the world become successful entrepreneurs, while preserving and promoting art forms and cultures indigenous to their respective communities. The founding of the Santa Fe International Folk Art Market at Arlington continues this tradition by providing more opportunities for artists to succeed. Jeff Snell, CEO of the International Folk Art Alliance, adds, “IFAA is thrilled to find in Arlington, Texas the right partners—the Arlington Convention & Visitors Bureau, The University of Texas at Arlington, Arlington Cultural Tourism Council, civic leaders, and stellar community leaders in Linda Dipert and Tony Pompa—to help create more opportunities for artisan-entrepreneurs from around the world. The artisan sector is second only to agriculture in creating economies globally, so hats off to our partners in Arlington for their shared vision in building enterprise through excellent folk art that positively transforms communities worldwide." The International Folk Art Alliance, based in Santa Fe, New Mexico and the International Corridor Vision based in Arlington, Texas are 501(c)(3) nonprofit organizations working in collaboration to produce the Santa Fe International Folk Art Market at Arlington. Their mission is to celebrate and preserve living folk art traditions and create economic opportunities for and with folk artists worldwide. Tickets are now on sale and available through www.folkartalliance.org/arlington.